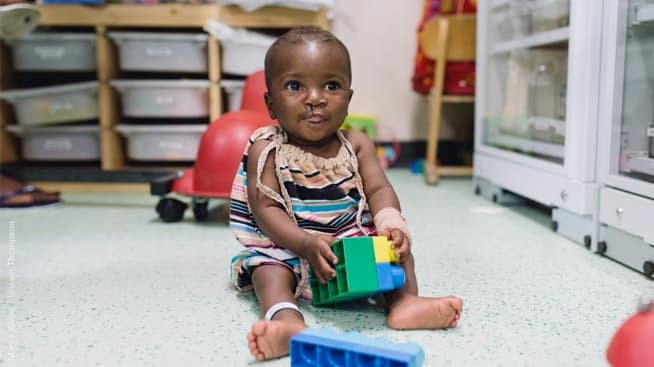 Eight-month-old Mohammed and his mother traveled to the Africa Mercy, where Sayoe found friendships with other mothers of cleft lip babies who all shared a common bond. Following surgery, Mohammed nestled into the neck of a ward nurse, enjoying the healing cuddles that greeted him daily on the Africa Mercy. Thanks to Sayoe’s courage and love for her son — and thanks to the generosity of friends like YOU — her handsome baby boy was given a new chance at life! 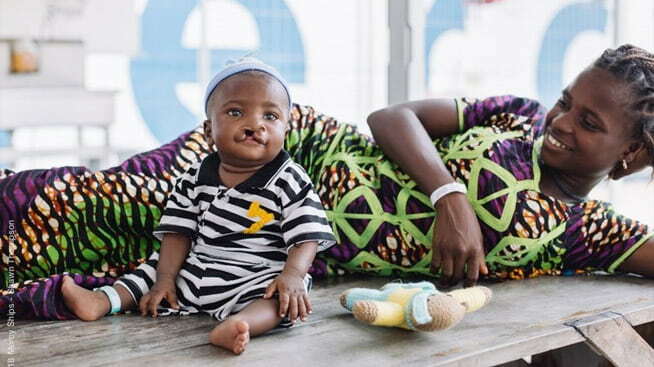 Following a surgery to correct his cleft lip and palate, Mohammed beamed his beautiful new smile to his doting mother, and she thanked God for giving the gift of life to her little boy, not once, but twice. Nineteen-year-old Sayoe never imagined she would be greeted with anything except joy when she gave birth to her first child. But when baby Mohammed was born with a cleft lip and palate, people accused her of witchcraft, saying that her baby’s deformity was a curse. Despite being encouraged to abandon Mohammed, who was even called a ‘devil child,’ she fought to protect him. Faced with taking care of Mohammed on her own, she took him to a local clinic in her home country of Sierra Leone. 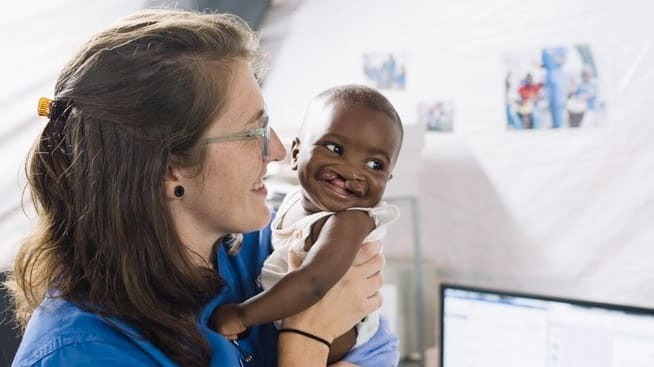 It was here that she met a doctor from Holland, Dr. Sandra, who spent 14 years with Mercy Ships as a child while her parents served as volunteers in the 1980s. 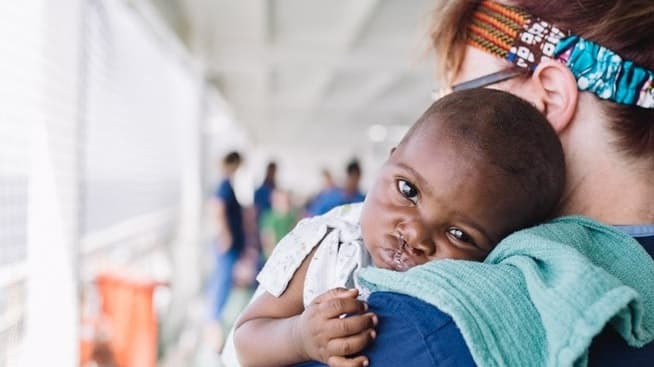 Dr. Sandra knew that the Africa Mercy was in the neighboring country of Guinea, so she arranged for Sayoe and Mohammed to journey to the ship, where she was confident they would be accepted for a surgery to correct his cleft lip and palate. Eight-month-old Mohammed and his mother traveled to the Africa Mercy with other mothers and babies referred by Dr. Sandra. It was here that Sayoe found friendships through a common bond. These brave mothers also loved their children despite facing abandonment by their communities. Sayoe spent her time on the Africa Mercy learning to break through the guilt and shame that had been put on her. Thanks to her courage and love for her son — and thanks to the generosity of friends like YOU — her handsome baby boy was given a new chance at life!